Precisely why Canazei di Fassa Dolomiti isn’t better-known and more popular among discerning skiers is a mystery. This is the kind of place that exists purely for those who are out for the most enjoyable, uncomplicated and exquisite skiing Europe has to offer. Well-groomed pistes, an unpretentious atmosphere and a distinct lack of the kinds of crowds that never fail to put a crimp on your day. Combined with stunning scenery and a gorgeous local dining scene, we ask once again – why hasn’t Canazei di Fassa Dolomiti (yet) become a mainstay for those in the know? Situated right at the heart of the mighty Dolomites, Val di Fassa is a region rich in beauty, culture and unrivalled ski opportunities. After all, you’ve got the world’s single biggest ski area – the incredible Dolomiti Super-Ski – right there on your doorstep. The history of the region far predates its winter sports heritage. So much so that the Ladin language is still spoken here, along with the more common Italian and German languages. Located at the far end of the Val di Fassa, Canazei is the kind of place that takes a little effort to take in fully. Nevertheless, it also boasts what’s possibly the most beautifully scenic expanse of intermediate slopes in this part of the world. And once again, the Dolomiti restaurant scene has more than made its mark on Canazei di Fassa Dolomiti – a mecca for anyone interested in tasting the best the region has to offer. There are no direct train connections to the resort itself. If you’re travelling by train, the nearest railway stations are at Bressanone (Brixen in German) around 58km away or slightly further at Bolzano (Bozen). Transfers can then be arranged to take you on to the resort. All of the above will only ever result in our base-rate for ski transfers going down – we never over-inflate our prices at any time or for any reason. Unlike others, we consider as many factors as possible to lower our standard rates whenever possible. We always recommend booking in advance, in order to access the very best deals and discounts. We also offer substantial discounts for off-peak, off-season and midweek transfers to Canazei di Fassa. If looking for the best possible deals, travelling outside peak season or midweek typically results in the biggest savings. We offer midweek (Monday to Friday) prices with up to 60% discount than weekend prices. Though Canazei di Fassa Dolomiti may lack an abundance of green runs, there are still some excellent nursery slopes and gentle runs for beginners and children alike. Of course, the fact that the Dolomiti Super-Ski area is right at your doorstep means more than 660 incredible slopes to check out across the area. 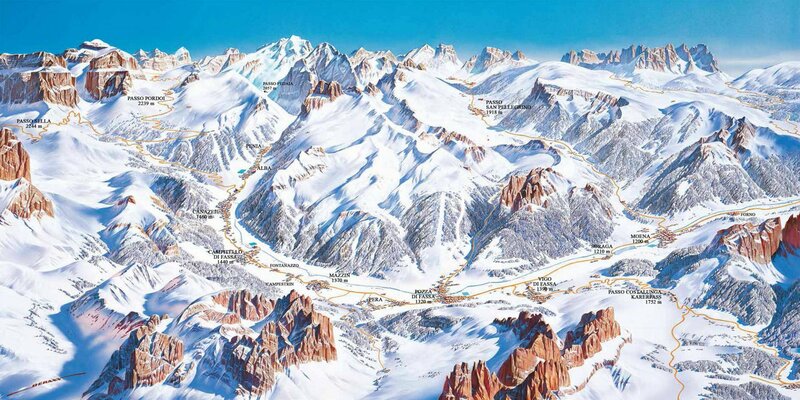 Canazei di Fassa Dolomiti is one of the best ski areas in Europe for intermediates. By contrast, beginners and experts play second-fiddle somewhat. However, there are some great ski schools in the area and plenty of gentle slopes for introducing kids to winter sports. The resort itself is also one of the most accommodating, friendly and entertaining for families with kids of all ages. Booking quality resort transfers is about more than just getting to your destination. The way we see it, it’s about ensuring the perfect start to your holiday and peace of mind throughout. That’s why Alps 2 Alps is proud to offer the total service package of quality, reliability and value for money. We advice booking as early as possible to take advantage of maximum availability and the lowest possible prices. If you can’t find the resort or service you require on our website, simply get in touch with the Alps 2 Alps team and we’ll do our best to help. Great trips to Canazei di Fassa Dolomiti start with the best transfers – let the experts at Alps 2 Alps show you the way!